Leading-edge care for dazzling full smile makeovers! Our experienced dentists can help you have the smile you have always wanted. Your smile can have an incredible impact on your personal confidence, as well as your professional growth. A smile can open doors and melt hearts. Dr. Matthew Sheldon is a knowledgeable cosmetic dentist who can help you have a beautiful, confident smile through high-tech cosmetic dentistry. Our general approach is to evaluate the whole mouth, including the health and aesthetics of your teeth. We will make recommendations as to which procedures should be included in your smile makeover. 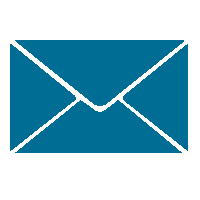 We’ll educate you as to what to expect from these procedures, and give you other options, so you can make an informed decision as to what procedures are right for you, and your budget. 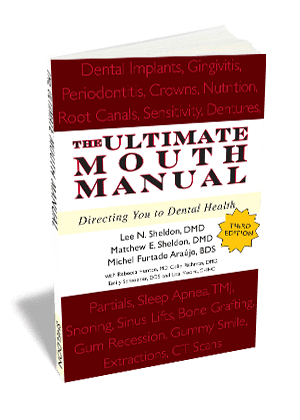 Dr. Matthew Sheldon is a very knowledgeable, competent dentist who can do a full smile makeover that will not only make your smile beautiful, but fully functional and healthy, too. To keep up-to-date on the latest technology and treatment options in dentistry, he is committed to continuing his education in order to provide the most effective and minimally invasive dental care possible. Dr. Furtado can help you with a variety of procedures to alleviate a "gummy smile" or to cover exposed root surfaces. You don’t need to make multiple visits to get a gorgeous, new smile. There are various smile-enhancing procedures that Dr. Sheldon can perform that will quickly transform your smile in just one or two visits. Porcelain veneers, teeth whitening, and dental bonding can make a big impact on your smile with very little time spent in the chair. And if you have crooked teeth, be sure to ask about Invisalign® “invisible” teeth straightening. Dr. Matthew Sheldon will show you how your smile can look with cosmetic procedures. 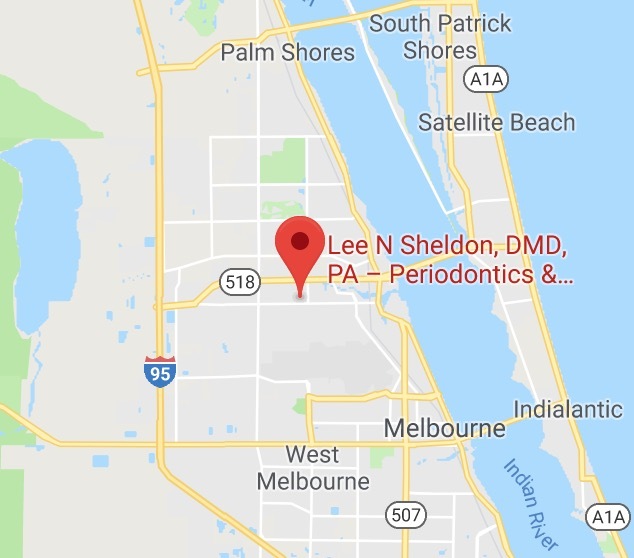 Your cosmetic dental care begins with a consultation, where you look at your teeth in a small mirror so you can show Dr. Sheldon exactly what you want changed. He will show you “before and after” photos of people who had similar dental situations as yours – and how we transformed their smile. 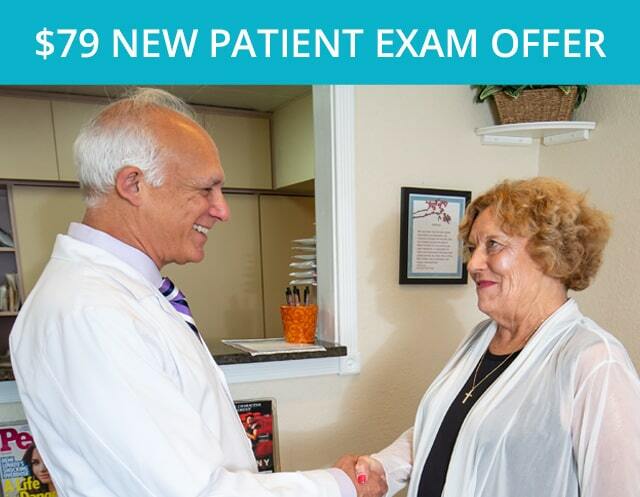 Dr. Matthew Sheldon patiently listens as you explain your dental goals so that he can better personalize your care. 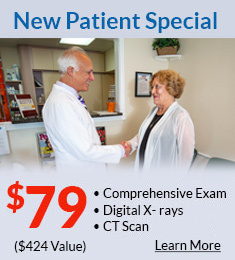 You’ll receive a comprehensive oral exam with the diagnostic images of your smile projected on a large screen for your viewing. 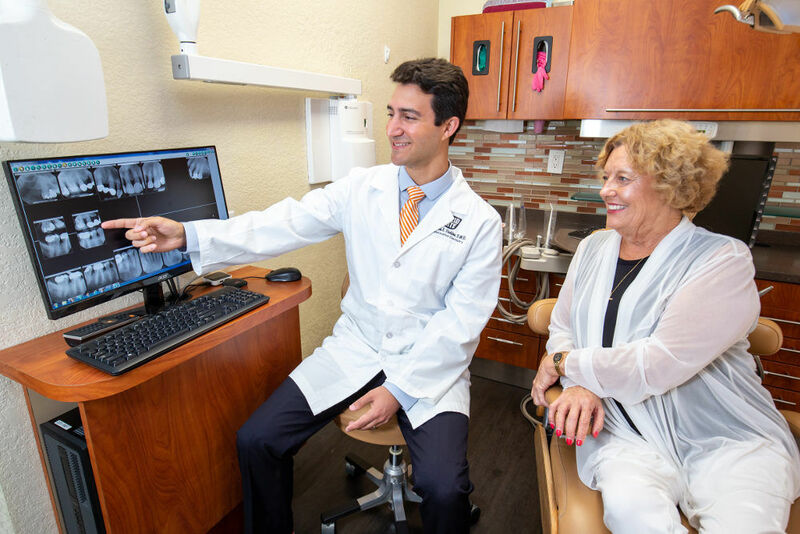 Doctors Sheldon and Furtado will discuss their diagnosis in easy-to-understand language, not “doctorese.” For complex cosmetic cases, the doctors have a variety of digital tools to help you choose your ideal smile and to plan your case. 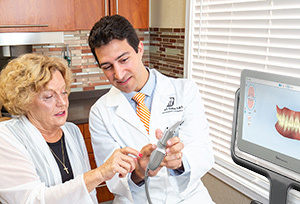 Our intraoral scanners use a wand with a tiny camera on it that takes thousands of pictures of your mouth and teeth. The scanner captures all the same areas that are captured with the goop. They are more accurate and faster than the traditional goop. This benefits patients in many ways: it’s precise, you can take breaks in the middle of the impression if you need to, and there’s no mess. Our doctors explain all procedures and make sure you understand each step of the process. 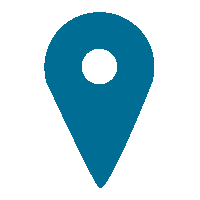 We will work with you to understand your individual dental needs so that we can find the best solution. If you are experiencing decay, discoloration, gaps, misalignment or loose teeth, it’s important to know how a cosmetic dentist can transform your smile. Our dentists take a conservative approach to cosmetic dentistry. This means they are interested in preserving the natural tooth whenever possible and that they won’t pull teeth if they can avoid it. Our dentists can perform a wide variety of smile-enhancing procedures right in the office. 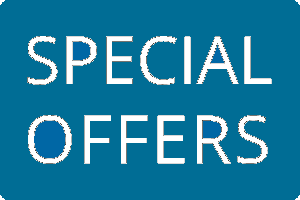 Just click on a link below for more information. Onlays and inlays are used to repair large cavities and can replace silver fillings for a natural look. Veneers are usually used to cover chipped, stained or discolored teeth, but they may also be used to close gaps and repair mildly crooked teeth. Crowns can fix similar conditions as veneers, but have the added benefit of enhancing your bite. Invisalign “invisible” braces are the clear alternative to unsightly metal braces. Implants are the most lifelike replacements for missing teeth and can let you eat, smile and speak naturally and comfortably. We can reshape the gum line in order to create a more beautiful smile. If your roots are exposed giving you that "long in the tooth look," we can help you cover those roots with a variety of conservative root coverage procedures including the Pinhole Surgical Technique. If your teeth seem short, the problem may be an overabundance of gum tissue, which we can correct with cosmetic tooth lengthening. To whiten your teeth, we offer Poladay, which is currently the take-home tray system with the highest strength of hydrogen peroxide on the market today, for optimal results. 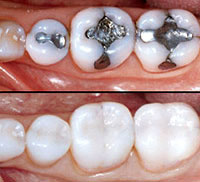 These fillings, also called composite fillings, are made from metal-free tooth-colored materials. They can restore the natural appearance of a decayed or previously filled tooth. Dental bonding is an economical tooth-colored resin material that’s applied and hardened with a special light, which ultimately "bonds" the material to the tooth to fix a chipped, stained or a broken tooth. Our dentists usually recommend porcelain veneers to fix these types of problems. That’s because of porcelain’s superior durability and stain-resistant properties, which makes veneers a better value in the end. Inlays and onlays are restorations that are made to rear teeth that have a mild to moderate amount of decay. We use inlays and onlays when a filling would compromise tooth strength and we are confident the remaining portion of the exposed tooth is strong enough to last. In treating dental decay, inlays and onlays help to eliminate tooth sensitivity and eventual tooth loss. The durable material from which inlays and onlays are made helps them last up to 30 years. These often can be handled with dental bonding, which is the application of tooth-colored composite resin to repair a decayed, chipped, fractured or discolored tooth. Typically teeth are whitened with bleaching or porcelain veneers. Recontouring can reshape your teeth. 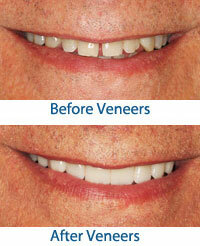 Another option is the use of porcelain veneers. We use tooth-colored fillings and can also remove your unsightly metal fillings. Porcelain crowns, inlays or onlays are usually used to handle broken-down teeth. Often gaps can be treated with Invisalign braces, but for a fast and very effective treatment, gaps can be closed with porcelain veneers and sometimes dental bonding. In some cases crooked teeth can be given a uniform appearance with porcelain veneers. For more severe cases they can be straightened with Invisalign braces. “I can now smile with confidence and am no longer ashamed of my teeth. 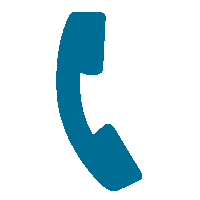 Dr. Sheldon listens, understands and works to accomplish your needs.